Revil, A., Le Breton, M., Niu, Q., Haskins, E., and Thomas, D.M., 2017. Induced polarization of volcanic rocks – 1. Surface versus quadrature conductivity, Geophysical Journal International, v. 208, n. 2, p. 826–844, doi: 10.1093/gji/ggw444. Revil, A., Le Breton, M., Niu, Q., Wallin, E., Haskins, E., and Thomas, D.M., 2017. Induced polarization of volcanic rocks. 2. Influence of pore size and permeability, Geophysical Journal International, v. 208, n. 2, p. 814–825, doi: 10.1093/gji/ggw382. Thomas, D.M., Pierce, H.A., and Lautze, N.C., 2017. Integrated Geophysical and Drilling Results for Mauna Kea Volcano: Hydrologic Implications; Abstracts with Programs, GSA Annual Meeting, Geological Society of America, Seattle, WA (Vol. 49, No. 6. doi: 10.1130/abs/2017AM-308419). Millett, J.M., Haskins, E., Thomas, D.M., Dougal, A.J., Planke, S., Healy, D., Kuck, J., Rossetti, L.M.M., and Farrell, N.J.C., 2017. Lava flow reservoirs during burial: laboratory petrophysical and wireline geophysical results from two fully cored boreholes, Big Island, Hawaii; Joint Assembly of the Tectonic Studies Group (TSG), Volcanic and Magmatic Studies Group (VMSG) and British Geophysical Association (BGA); University of Liverpool. Thomas, D.M., and Haskins, E., 2015. New Insights into the Influence of Structural Controls Affecting Groundwater Flow and Storage Within an Ocean Island Volcano, Mauna Kea, Hawaii, Abstract H31D-1446 presented at 2015 Fall Meeting, AGU, San Francisco, Calif., 14-18 Dec (poster). Lautze, N.C., Calvin, W., Moore, J., Haskins, E., and Thomas, D.M., 2014. Study of Hydrothermal Mineralization in 2013 Drill Core from Hawaii Island. Abstract H43A-0953 presented at 2014 Fall Meeting, AGU, San Francisco, CA 15-19 Dec (poster). Lienert, B.R., Thomas, D.M., and Wallin, E., 2014. Preliminary Results of a Magnetotelluric Survey in the Center of Hawaii Island, Abstract GP33A-3702 presented at 2014 Fall Meeting, AGU, San Francisco, Calif., 15-19 Dec (poster). Thomas, D.M., Wallin, E., Lautze, N.C., Lienert, B.R., and Pierce, H.A., 2014. A Blind Hydrothermal System in an Ocean Island Environment: Humu’ula Saddle, Hawaii Island, Abstract V21A-4731 presented at 2014 Fall Meeting, AGU, San Francisco, Calif., 15-19 Dec (poster). Calvin, W., Lautze, N.C., and Haskins, E., 2014. Alteration in Hawaiian drill core using a portable field spectrometer, Paper No. 170-1 presented at 2014 Geological Society of America Meeting, Vancouver, B.C., Canada 19-22 Oct, 46:6, 426. (paper). Thomas, D.M., and Haskins, E., 2013. Analysis of hydrologic structures within Mauna Kea volcano using diamond wireline core drilling, Abstract H11I-1263 presented at 2013 Fall Meeting, AGU, San Francisco, Calif., 9-13 Dec (poster). Lautze, N.C., Haskins, E., and Thomas, D.M., 2013. 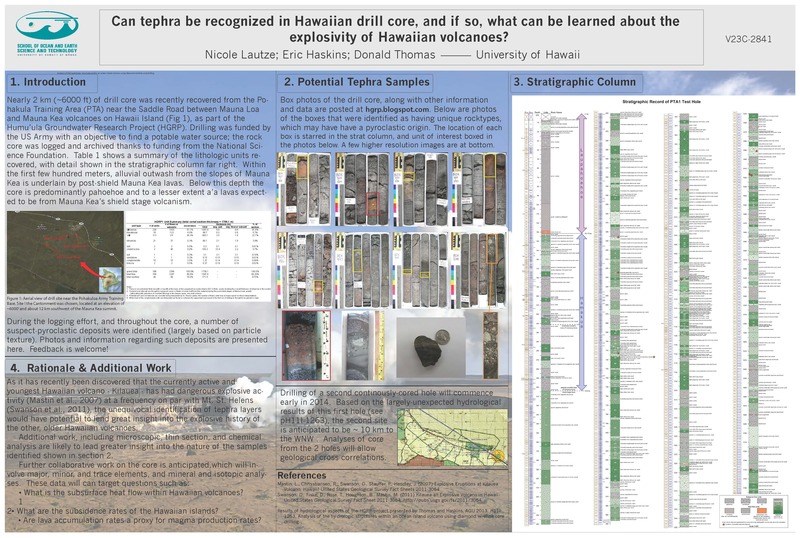 Can tephra be recognized in Hawaiian drill core, and if so, what can be learned about the explosivity of Hawaiian volcanoes?, Abstract V23C-2841 presented at 2013 Fall Meeting, AGU, San Francisco, CA 9-13 Dec (poster).